Manifesting the design inspiration of a Zen Master, the Auberge du Soleil Spa offers a tranquil retreat for reflecting, relaxing and restoring. The picturesque Spa courtyard is anchored by mature olive trees and a centerpiece of three stone basin fountains perfectly aligned with Mount Veeder in the distance. Surrounded by the beauty of the landscape, the serene setting provides a connection with nature and instills the healing power of pleasure. Each treatment is delivered with a nurturing touch and customized to guest preferences. 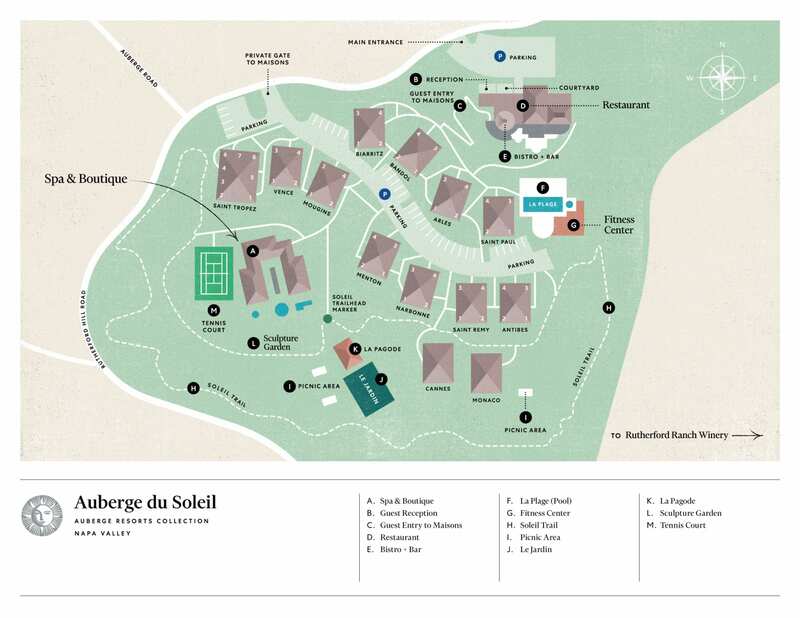 The Auberge du Soleil Spa is reserved exclusively for our hotel guests. A luxurious facial using advanced ingredients rich in marine collagen, active botanicals, powerful antioxidants and exfoliating enzymes, combined with a micro-current lift for immediate results. An exclusive after hours access package featuring a three-hour couples experience including private garden soak, steam, massage, sparkling wine and sensuous dessert served under the stars. A private couples spa treatment including body exfoliation, bath, massage, scalp and foot treatment. Also includes fruit and wine pairing. Arrive early to enjoy a refreshing eucalyptus steam, then soak in a private herbal detox bath with essential oils of wintergreen, eucalyptus, rosemary and thyme. An application of magnesium gel precedes a delightfully aromatic and soothing Auberge massage. Take home gratis bath salts for a warming foot soak. *Add complimentary warm basalt stones based on availability. Enjoy a sense of Auberge du Soleil at home. Our signature line of bath products feature a range of hand-crafted cleansing gel, shampoo, conditioner, body lotion and oil incorporating custom blends of local ingredients including chamomile, lavender, sage, lemon verbena, rosemary, mint and grapeseed. Available in our Spa Boutique or order from our online Shop.